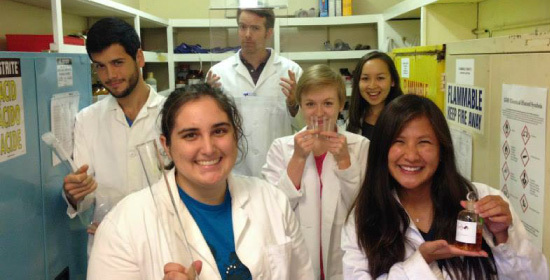 Associated with the national society of the same name, the American Chemical Society (ACS) Club unites students who are interested in exploring chemistry outside of the classroom. Members are encouraged to participate in our field trips, demonstration team, research projects and science awareness days. Please email acs@gmail.com if you are interested. 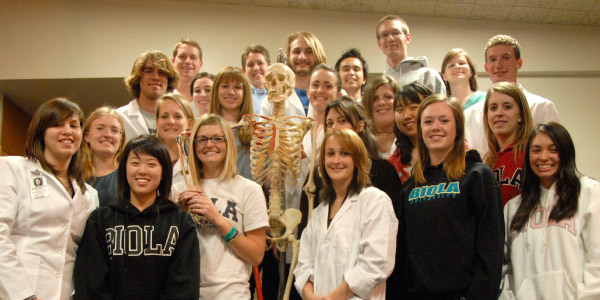 A student-led group designed to bring together, educate and support Biola students pursuing future healthcare careers. Atomic force microscopy (AFM) has been a powerful tool in many areas of research that involve surface morphologies. The ability of AFM to examine biological samples in the physiologically native environment makes it an ideal tool to study cell structures. Currently, ciliary structures of tetrahymena and surface structures of cancer cells are being investigated. Experiments are carried out on an in-house AFM. Students are involved in this project. I am using computational chemistry to study the spectroscopic effects related to intermolecular interactions in both natural and synthetic fluorescent materials. In this work, students and I prepare materials and characterize them by collecting vibrational, absorbance, and fluorescence spectra. We then compare this experimental data to the results of theoretical calculations performed on BLESS, the Biola Low-Emission Scientific Supercomputer, a solar-assisted 40-node computing cluster housed in Bardwell Hall.